Southern Maine wedding venues are second to none, anywhere in the world. What a terrific destination wedding location -- close to Boston, New York, and Montreal -- yet far enough away to feel like you're worlds away. 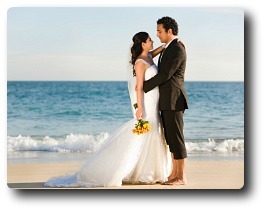 In fact, Ogunquit Beach Maine is at the #1 spot on the The Knot's list of America's "Ten Best Beaches For A Wedding". You can have just about anything you want here -- we've got fabulous, fresh air beach theme weddings complete with a lobster or clambake feast reception, or sparkling, magical, all-white winter weddings. You can get married with one of the world's most famous lighthouses as your backdrop, or at a super-elegant oceanfront resort. How about getting married during a summer sunset on a ship in Maine waters? My sister did, and it was one of the most memorable Maine wedding locations I've ever seen. It's completely ironic that I adore weddings this much, and yet I've been so fortunate that I'm only going to have one wedding (a September '92 oceanside ceremony -- and we're still going strong). Usually you do what you love as a career or hobby, but I think my husband would object if I made getting married my hobby...I even go to the local wedding shows, just to do a little daydreaming of my own. Plus, they always have a lot of really good free candy.